Posted by Douglas Fisher on Tuesday, December 20, 2016 in News. 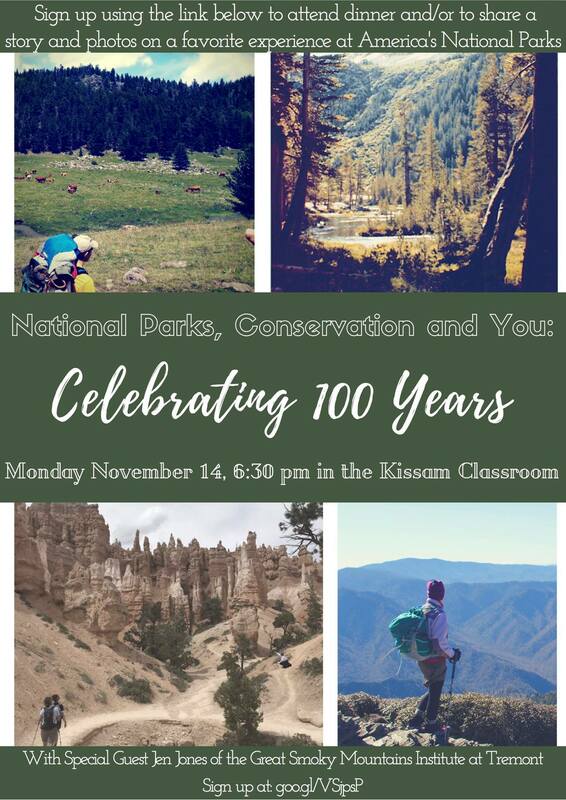 At the start of Fall 2016, Moore College RA Minta Ray approached a number of us at WaM with an idea for an event to celebrate the 100-year anniversary of the National Parks Service. Minta suggested that an important part of the event could be attendees sharing their experience with the National Parks, which was a brilliant idea. We decided on a dinner at the Kissam Center, upstairs, with a speaker, followed by presentations by audience members who signed up ahead of time to so present. At Minta’s suggestion again, we asked Dr. Jen Jones, Director of the Great Smoky Mountains Institute at Tremont, to be our dinner speaker. Jen agreed. This event would be the fourth installment of the Warren and Moore Environmental Series. On November 14, we held the celebration, with a wonderful buffet from Campus Dining. There were many SPEAR members in attendance, including the co-presidents Catherine Mitchell and Daniel Shaykevich; there were members of Wilskills, and the Director and the Activities Coordinator of Vanderbilt Outdoor Recreation, Linda Rosenkranz and Sean Wilkerson, respectively. The poster for the National Parks celebration incorporated pics by Minta, Doug, and Daniel. Jen’s talk, which started as people were launching into dessert, included something of the history and mission of Tremont, and she talked about how we could use our experience in the outdoors generally, and with the National Park Service specifically, to educate others — as citizen educators, scientists, journalists, and activists. A number of us then gave fast-paced presentations, typically with lots of pics, on our experience with the National Park Service. Alisha Newton talked about her time in Alaska; I flew through my experiences in Sequoia, Kings Canyon, and Yosemite National Parks out west, but spent most on my five-minute presentation talking about one of the most memorable national monuments (also under the National Park Service). Professor Lovensheimer talked about his time living adjacent to the Smokey Mountains National Park, and some of the area history. Minta presented on the Smoky Mountains too, and elsewhere. Finally, Linda and Sean of Outdoor Rec each talked about some very different National Park experiences. In addition to my presentation, perhaps we will link to others as those presentations become available. Doug Fisher is Faculty Director of Warren College. The opinions expressed herein are Doug’s and do not necessarily represent those of Vanderbilt University.